Like most vitamins, vitamin B3 (niacin) may be obtained in the recommended amount with a well-balanced diet, including some enriched or fortified foods. 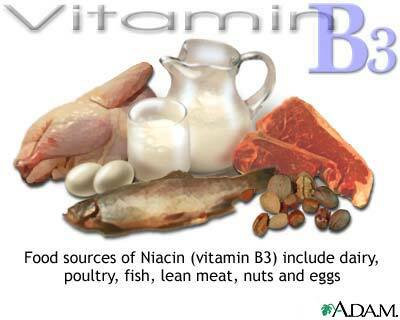 Niacin can be found in nuts, dairy products, lean meats, poultry, fish, and eggs. Some niacin is also supplied by legumes and enriched breads and cereals. The best dietary sources of vitamin B3 are found in beets, brewer's yeast, beef liver, beef kidney, pork, turkey, chicken, veal, fish, salmon, swordfish, tuna, sunflower seeds, and peanuts. Good sources of niacin include yeast, meat, poultry, fish (e.g., tuna, salmon), cereals (especially fortified cereals), legumes, and seeds. Milk, green leafy vegetables, coffee, and tea also provide some niacin. In plants, especially mature cereal grains like corn and wheat, niacin may be bound to sugar molecules in the form of glycosides, which significantly decrease niacin bioavailability. Niacin is widely distributed in foods of both animal and vegetable origin. Particularly good sources are meat (especially liver), groundnuts and cereal bran or germ. As for other B vitamins, the main source of supply tends to be the staple food. whole-grain or lightly milled cereals, although not rich in niacin, contain much more than highly milled cereal grains. Starchy roots, plantains and milk are poor sources. Beans, peas and other pulses contain amounts similar to those in most cereals. Other animal and plant sources for Niacin include beef liver, brewer's yeast, broccoli, carrots, cheese, corn flour, dandelion greens, dates, eggs, fish, milk, peanuts, pork, potatoes, tomatoes, wheat germ, and whole wheat products, alfalfa, burdock root, catnip, cayenne, chamomile, chickweed, eyebright, fennel seed, hops, licorice, mullein, nettle, oat straw, parsley, peppermint, raspberry leaf, red clover, rose hips, slippery elm, and yellow dock. There are three synthetic forms of this vitamin: niacinamide, nicotinic acid, and nicotinamide. Taking a synthetic form of the vitamin can help one avoid the "niacin flush". The flush is temporary and only associated with large doses. However, pure niacin is found in relatively small amounts in most foods. Turkey meat is rich in tryptophan, and so is a good source for Niacin. Niacin is available as a tablet or capsule in both regular and timed-release forms. The timed-release tablets and capsules may have fewer side effects than the regular niacin; however, the timed-release are more likely to cause liver damage and are therefore not recommended for long-term treatment. Regardless of the form of niacin being used, periodic checking of liver function tests is recommended when high-dose (2 – 6 gm per day) of niacin is used.